Even though I have tons of cookbooks I will often search online for recipes from my favorite chefs; which is how I found the Mario Batali recipe below. His recipe originally called for quail but I used game hens instead, since they were easier to find at my local supermarket. I imagine chicken would work equally as well. This savory one pot meal takes a little bit of advance planning to marinate the fowl, but the results are so worth it. Marinate meat in balsamic honey marinade for 1 to 2 hours. Season each quail inside and out with salt and pepper and wrap each one in a slice of prosciutto, securing with toothpicks. In a 14 to 16-inch saute pan, heat the olive oil over high heat until almost smoking. Add the quails, a few at a time, and brown over high heat, adding some of the wine with each batch of quails. When the last batch is browned, return all to the pan and add the artichokes and garlic. Add more wine if necessary to maintain moisture in the pan, and cook, covered until the quails and artichokes are tender. In a bowl large enough to hold both the marinade and the quail, mix all the ingredients together. Great recipe and artichokes are a nice touch. Artichokes are my like crack!! I love hens and never see enough recipes for them. The artichokes send this dish over the top. Wow I love the sound of that marinade, yum! You had me at "one pot meal"...oh, and the delicious looking photos of course. I love artichokes... these look so good! I love everything about this dish, so many amazing flavors! I'll have to pin this recipe- my friend told me she'd get me some quail soon, as her husband hunts more than he eats, and I've never had quail! I'm not sure I've seen quail at my market either, but it sure looks good with game hens! Great recipe! This looks amazing! 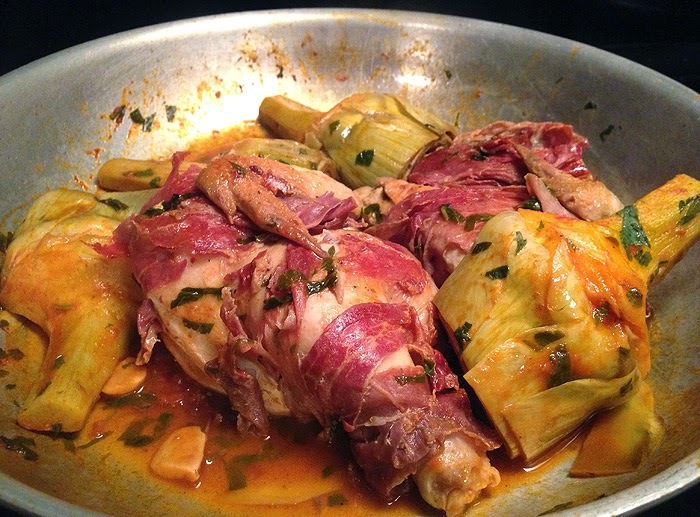 I love everything from the artichokes to the prosciutto to the balsamic-honey marinade. What a delicious recipe. Thanks for sharing. I have never cooked quail! But i have used game hens. I love the sound of this recipe! I have never had quail, but this makes me want to try it! I'm thinking I must try this on chicken! Looks delish! I love the look and sound of this recipe. That marinade!! Well, it's a Mario Batali recipe so, yea... Always amazing. Quail and artichokes. You couldn't have chosen more seductively yummy foods!!! Beautiful recipe and photos!! Love this! I need to look into where I can find quail around here because it's s delicious but never get to eat it unless I'm dining out. This looks AMAZZZING! What a great dish for company or a special night!